Very professional. I’ve not had to use this type of service before so I’ve nothing to compare. However, I was beyond impressed when an IV can be put in without almost noticing it! Very quick, efficient, pleasant. Made me relieved to be in good care. Lady who did my EKG etc was very efficient and I believe caught the problem that before had not been [caught]. (14-54068; R. Buechele, M. Sparks, C. Judge). Caring and good at explaining what was going on. (14-54065; R. Balkun, D. Rice). Dedicated, professional and knowledgeable. (14-53413; C. Ferguson, P. Kelley). Excellent service! The ambulance rides like a truck and is uncomfortable. Very bumpy ride. Efficient. The EMTs had a tough job with me – I had a broken shoulder, they had to get me out of a tiny bathroom without further injury or pain and I think did an excellent overall job. (14-16235; M. Levasseur, R. Bilodeau). Very caring, concerned and skilled. I felt totally helped and saved by the whole team that arrived. I don’t know what I would have done without them. (14-51246; J. Bush, D. Tedeschi responding with East Hartford Fire Department). The ambulance crew was excellent. (14-58696; R. O’Neil, S. Boutot). Efficient, professional and friendly in a scary situation. 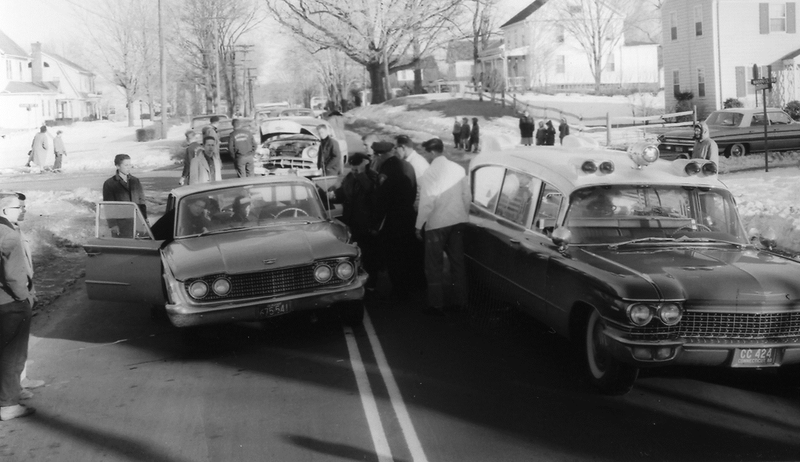 (14-59545; M. Levasseur, R. Anderson with Manchester Fire Rescue EMS). Dedicated, hard working, caring people. Especially Michael (handlebar mustache), a credit to your organization (presumably from East Hartford Fire Department) (14-60280; J. Bak, P. Kelley with East Hartford Fire Department). MANCHESTER — On August 20, 2014 the Ambulance Service of Manchester promoted four from within its EMT ranks to the post of Field Training Officer: Dan Hammett, Andrew Hedburg, Michael Hoyt and Brian Langan. FTOs are utilized primarily to train newly hired employees in the performance of their duties as EMTs. Dan Hammett: I have been with ASM for almost three years and an EMT for just over four years. I first got involved in EMS w/ the Scotland Volunteer Fire Department and was promoted to EMS Captain this past year. Some of my duties are QA/QI and to train new members which will be a great asset to train new employees. I have been married for three years and live with my wife in Scotland. I look forward to meeting new people and to train them and represent ASM! Andrew Hedburg: I have been a member of the ASM team for 3 1/2 years. While not at work I enjoy spending time with my family. My wife Sam our daughter Charlotte and crazy dog Otis enjoy spending much of our time out side. From sitting on the beach playing in the waves to working in our gardens. I began my career in EMS volunteering with East Haddam Ambulance. I quickly found that this job was my passion and was lucky to get hired by ASM. During my employment I have had many wonderful experiences and have found that I have a passion for teaching new EMTs. I look forward to helping to continue to build this excellent team. Michael Hoyt: Ever since my first day of EMT class I have been impressed with the quality and caliber of the employees of ASM. Having the opportunity to work with new employees to ensure they meet the high standards of ASM is something I look forward to. I hope to instill a strong foundation of compassion, patient advocacy, as well as quality medical care that employees can build upon throughout their time at ASM. 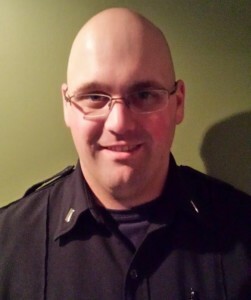 Brian Langan: I have been an EMT for nine years and an AEMT for four years. I started at ASM while in college working every weekend and when I graduated I became full time. 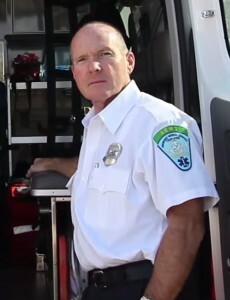 I began my career in the first responder field with the Glastonbury Fire Department, with which I am still very active. On September 6th I will marry my fiance Natasha Snyder and I am fortunate that she understands my work hours! I have always enjoyed helping people and am happy to be able to assist in their times of need. 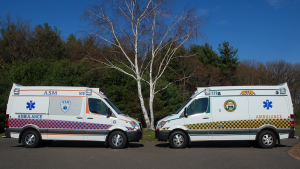 MANCHESTER –As of August 21, 2014, ASM’s Steeve Parent has been cleared by Eastern Connecticut Health Network medical control for independent dispatch as a paramedic to the towns that ASM serves. Steeve’s preceptors were Paramedic Supervisor Melissa Osborne and Paramedic Sue Allen. The full precepting phase can take ten to 12 weeks or more as the paramedic is prepped for the realities of the field. As with all precepting phases at ASM, Steeve’s final approval came from Eastern Connecticut Health Network after shadowing Steeve and his preceptor in the field as they responded to emergency calls. 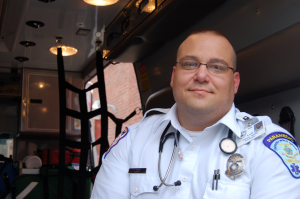 Steeve started at ASM as an EMT-Basic in 2012 and graduated from the Capital Community College Paramedic Program. On behalf of the ASM Family, we would like to wish Steeve the best of luck and say we are very proud to have such skilled professionals on staff. EAST HARTFORD — On August 20, 2014, two crews from ASM assisted with Vice President Joe Biden’s visit to Connecticut by being part of the motorcade and standing by at Goodwin College in East Hartford. Pictures are attached, care of Dan Hammett and Jason Bak. A special thanks to East Hartford Fire Department for their partnership. Professional, courteous, considerate, caring and human! (14-44049; S. Crittenden, M. Khan). Very caring. All 4 of the responders were calm, kind and so helpful. My son was in great hands as the patient as were my daughter and I also. The crew was professional and very calming. (14-47322; M. Buerk, J. Krajewski responding with Manchester Fire Rescue EMS). Compassionate and efficient. Well trained. (14-47200; E. Sheils, D. Pozniak). Highly professional – They saved my life. Thank you! (14-48389; M. Osborne, M. Sparks). Prompt, professional, courteous (14-63998; M. Osborne, S. Parent). The ambulance staff were very helpful and kind. Thank you! (14-47902; G. Desrosier, M. Sparks). Excellent, knowledgeable, professional (14-65434; R. Bilodeau, R. Fross). I was very impressed with the whole crew! I had fallen and couldn’t have got up by myself (14-65831; T. Oliver, T. Luetjen). As good as it gets. (14-66424; R. O’Neil, J. Rasmussen, H. Carl). Professional and pleasant. (14-65995; A. Ordway). Amazing. We always use and trust ASM. Very compassionate. (14-65191; D. Slomcinsky, B. Langan). Very professional and caring! (14-57104; T. Marshall and B. Langan with Coventry Volunteer Fire Association). The services were excellent and professional. (14-66112; D. Noyes, T. Whalen). Very caring and professional. (14-66749; M. Pacheco, J. McKenna). 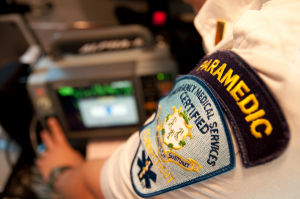 MANCHESTER — On July 31, 2014, five EMTs were added to the ASM team. As part of our continued growth ASM and Aetna seek out only the best candidates. We look for employees who are focused on high-quality patient care, are team oriented and conduct themselves in a professional manner. During the orientation, employees learn about company philosophy and goals, quality assurance, and policies and procedures. Tom Carey: FULL TIME, EMT. My name is Thomas Carey and I am 22 years old. I lived in East Hartford until I was 11 years old and then moved to South Windsor. I have always had a passion for helping others which is what drove me to public safety in the first place. Growing up I wanted to be everything a veterinarian, a zoo keeper, and even a paleontologist. Animals are one of my biggest passions in life. When I was in high school I was in a program called Kids N’ Critters, where we brought snakes, turtles, tortoises, lizards, toads, and frogs to elementary schools to teach children about the animals and what to do when they see one. I have handled all sorts of creatures, from snakes that are larger than I am to even alligators. I wanted to become a police officer for the ASPCA to protect animal rights, and that’s when I began my education into criminal justice at Manchester Community College. I also joined the South Windsor Fire Department and realized how much I enjoyed being a fireman. Since my membership I have completed Fire 1, Fire 2, and have been chosen to be a member of the departments Rescue Squad. My career choice had changed and now I want to become a Career Firefighter. So now here I am a member of ASM and I couldn’t be happier to be working in a field that I want to be in. Although the job will take up much of my time I am still looking into volunteering at an animal shelter of some kind as well as being involved in the fire service. Jeff Hornish: FULL TIME, EMT. My name is Jeff Hornish. I am 55 years old and live in South Windsor. I have a daughter who is an EMT and works at St Francis Hospital’s ED as a tech, and a three year old grandson (who calls me “B”). Born and raised in South Windsor, I enjoy camping and hiking. I went through a number of jobs until I found my career in EMS. I started as an EMT with the South Windsor Ambulance Corps on 8/8/2001. Over the years I’ve had many pleasant experiences working with ASM employees on intercept calls. I am very happy to be able to continue my EMS career working with those same people. I am very impressed by the professionalism and camaraderie here at ASM. I also plan to advance my career by becoming a Paramedic at ASM. Tom MacLean: FULL TIME, EMT. Hello, my name is Tom MacLean, I’m 24 years old and live in Vernon CT. I graduated Xavier High School in Middletown CT and went on to study Business Administration at Fordham University in the Bronx, NY. I did some volunteer work in the Vernon Fire Department in High School and really enjoyed the experience as a whole. In college, I became very business-minded and stepped away from EMS for awhile, but always missed the passion I felt in providing a service that really helped people. After working in the insurance industry for a couple years after school, a great opportunity opened up for me to complete my EMT certification. I went for it, and could not be happier with my decision. Outside of work, I like hanging out with my two boxer dogs and just having a good time. I’m a big New York sports enthusiast, and have always been a life long Yankee and Jets fan. Recently, I’ve also gotten pretty big into boxing – I love the discipline and it’s a great work out. I look forward to working at ASM and can’t wait to get to know everyone. Keith Ringuette: FULL TIME, EMT. Hello my name is Keith Ringuette. I am 22 years old and I am from Eastford, CT. I recently graduated with my Bachelor’s Degree from the University of Connecticut in Allied Health Sciences and I’m excited to have a career in the job field I have been studying. Before UConn I attended Quinebaug Valley Community College where I graduated with Honors with my Associate’s Degree. I have lots of hobbies that include reading, playing videogames, and playing or watching any kind of sport. 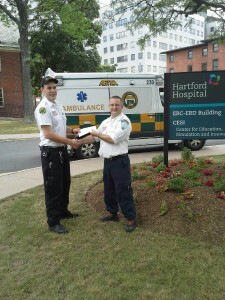 I obtained my EMT-B in 2012 after taking a course with Code One in East Hartford, CT. Both sides of my family have always been heavily involved in the medical field helping others, with their licensure ranging from LPN to Physician. I hope to continue my family’s legacy by getting experience as an EMT-B which will help me with my future goals of becoming a PA or nurse. If I were to get into graduate school I plan to join the military on scholarship so I can travel all over the world to open my horizons to the healthcare situations in other countries. My ultimate goal would be to become a PA in Orthopedic surgery aiding surgeons with surgical procedures. Joey Startup: FULL TIME, EMT. My name is Joey Startup and I live in East Hartford. I come from a firefighter background in the CT Air National Guard. I’ve served for about 11 years now and will retire at my 20 year mark. I’m proud to have served four tours. About five years ago I started practicing as an EMT at the professional level working for a commercial service in Meriden for about four years before making the move to ASM. I am currently attending school in MCC getting my prerequisites finished for a nursing career. I have a dog named Sasha that is my life and is spoiled to death. I am very excited to begin my career at ASM and get to know the ASM team. Professional and caring. I have to commend the EMTs for their efforts and concern. (14-54475; T. Whalen, D. Noyes). Team co-coordination and care – excellent and reassuring to both patient and family (14-53604; K. Baker, K. Beaulieu with Manchester Fire Rescue EMS). Very helpful during a very difficult time + caring. You have a excellent staff! Thank you. (14-53200; M. Traber, M. Sparks). As a complex medical patient I can be very difficult to treat. The entire crew showed tremendous cooperation and communication in my care and treatment. ie. the driver stopped for the EKG and the “stick” was coordinated with a stop light. What the crew did not realize was their patient is a firefighter, combat life saver and soon to be retired military soldier. I do not easily impress and the care and professionalism of your entire crew regardless of role, reflects great credit upon them and your organization. Please share this strong commendation with the crew. (14-40971; T. Allbee, C. Haag responding with Manchester Fire Rescue EMS). “Praise” The EMT/Paramedics were understanding of the situation, provided immediate evaluation of medical requirements and offered medical assistance with professionalism while maintaining the comfort and dignity of my husband. Thank you for being there. (14-52651; T. Allbee, H. Marshall). Really professional and calming. (14-51518; A. Fine, D. Hammett). As I expect it to be (professional at all times). Professional. Your team couldn’t have been better! Thank you. (14-43920; M. Carter, M. Flynn). Professional/well prepared. (14-60160; H. Jolly, A. Harkins). Ambulance crew [was] very skilled and pleasant. (14-40966; R. Buechele, H. Marshall). [R. Buechele] quickly figured out what would work with my daughter to slow down her breathing. (14-58100). Comfortable ride + competent crew. AWESOME!!!! (14-56665; R. Balkun, M. Hoyt). HARTFORD –As of August 4, 2014, Aetna’s Jose Platero has been cleared by Hartford Hospital medical control for independent dispatch as a paramedic to the towns that Aetna serves. Jose’s preceptor was Paramedic Matt Campbell. The full precepting phase can take ten to 12 weeks or more as the paramedic is prepped for the realities of the field. As with all precepting phases at Aetna, Jose’s final approval came from Hartford Hospital after shadowing Jose and his preceptor in the field as they responded to emergency calls. 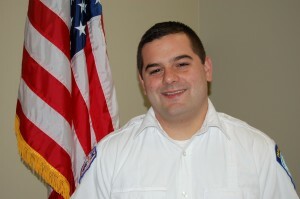 Jose started at Aetna as an EMT-Basic in 2011 and graduated from the Bridgeport Hospital Paramedic Program. On behalf of the Aetna Family, we would like to wish Jose the best of luck and say we are very proud to have such skilled professionals on staff.